Marc McNulty celebrated his first Scotland call-up with his seventh Hibs goal to send the Easter Road side on the way to victory over Motherwell. The on-form striker netted from the penalty spot after his shot had been blocked by the hands of Motherwell defender Tom Aldred. Captain David Gray powered home a header to double Hibs lead before half-time, those goals proving enough to give the Capital outfit a five point advantage over the Steelmen in that battle for a top six finish. Not only that, it sees them now hot on the heels of city rivals Hearts who sit a place above them in the table. Hibs endured a huge scare within 30 seconds of the start, Gboly Aiyibi racing past David Gray to make the bye-line before drilling over a low cross which Lewis Stevenson turned against his own post. Having enjoyed that escape Hibs almost conjured up a goal of their own, Stephane Omeonga's run and pass finding McNulty who fed it wide for Daryl Horgan to deliver an inviting cross which found the striker's head. McNulty, barely six yards out, directed it downwards but the legs of goalkeeper Mark Gillespie came to Motherwell's rescue. And it was that McNutly-Horgan partnership which brought the opening goal, the striker's clever flick setting his team-mate free. Horgan made good ground before cutting it back into the path of McNulty who saw his shot hit the arm of Aldred, leading referee Kevin Clancy to point to the spot, McNulty stepped up to apply his usual accomplished finish to give Gillespie no chance even although the goalkeeper had gone in the right direction. Even although they only had that solitary goal, Hibs looked well in control and added to their tally six minutes before the interval, Gray getting his head to Stevie Mallan's corner to bullet the ball beyond Gillespie. Hibs, however, lost Gray to injury only two minutes into the second half. The club skipper had been struggling after picking up an early knock and his departure resulted in Lewis Stevenson switching to right back as Sean Mackie took over on the left. 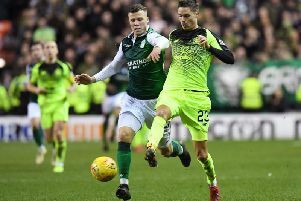 With that two goal cushion there was no real demand for Hibs to go seeking a third - as welcome as that would have been - Paul Heckingbottom's players content to keep Motherwell at arm's length while waiting for that opportunity to hit on the break. And Horgan should have done exactly that when Macie's cut-back came to his feet, the winger dragging his shot horribly wide with the goial gaping. Hibs goalkeeper Ofir Marciano had hardly been troubled but the Israeli internationalist pulled off a terrific save eight minutes from time, getting down low to knock away Aldred's header. Substitutes not used: Dabrowski, Shaw, I Murray, Allan. Substitutes not used: Ferguson, McHugh, Hartley, Donnelly.